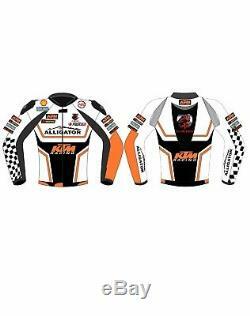 MADE TO MEASURE LEATHER MOTORCYCLE SUITS WITH CE CERTIFIED PROTECTION. Jackets are made from full grain 1.1mm to 1.3mm cowhide leather suitable for motorcycle applications. For comfort these leathers have four stretch panels. Contoured shoulders plus CE approved armour to the shoulders, elbows and knees. Velcro quick release racing knee sliders come as standard. Neoprene comfort collar and cuffs. There is a double layer of leather in the posterior area. Double and triple stitched seams are used throughout using a heavy duty nylon thread. High quality Max Zips are used throughout. Printing or embroidery of your name, logo, or any other picture of your choice. Jackets available in any colour and combination. 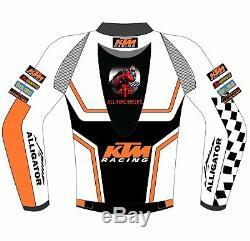 Send in your customised designs that can be made to match your bike, helmet or a business advertisement. Or send in a picture of a particular look that you have seen and we will recreate it. A crucial safety feature is that your personal blood group can be written on the suit on either the right or left shoulder. Please make sure that you take your exact body measurements ensuring that the tape measure is not too tight or too loose. We will add extra space according to the jacket design and your body shape if needed. We recommend that measurements are taken directly against the skin to get the most accurate size. Feel free to arrange a video call and/ or send us some photographs of your front/ back and side which will be used to determine the best fit or you. If you live within the UK and wish to have your measurements taken, you can arrange to. Visit the office in Bushey, London WD23 2AN. Please send a message to make an appointment. Jackets take between 15 to 20 days to make. Note: deliveries to Russia and Israel may take slightly longer. Any duty or custom charges, if applicable, are to be paid by the customer. Many thanks for looking at my site. 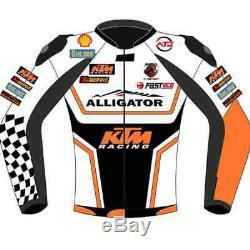 The item "KTM Motorcycle Jacket Mens Motorbike Leather Jackets Racing LeatherJackets" is in sale since Monday, January 1, 2018.